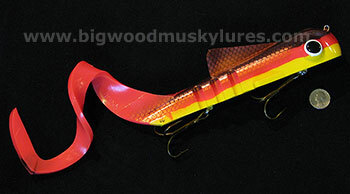 Description: The Swimmin' Dawg from Musky Innovations is a poured plastic paddletail bait with a slim body shape designed for belly roll and side to side flash. This swimbait has a flexible internal harness similar to Musky Innovations' Pro Dawg. Hand poured in the USA with quality materials and components. Can be fished with a straight retrieve or pause and pull technique. Comes with a custom formed, reusable clamshell for long term storage to maintain body shape. 11" and 7oz.. 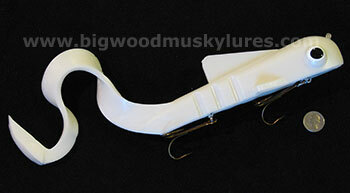 Description: The Magnum Bull Dawg is a hand poured, 100% soft plastic lure. It is balanced with a jig head so it swims down at a 45º angle on the fall and swims horizontal on the retrieve. The Bull Dawg can be used as a crankbait, jerkbait or a jig. 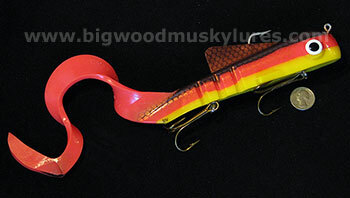 The Bull Dawg by Muskie Innovations, is considered to be one of the most versatile lures on the market today. When retrieved, it rocks back and forth as the curly tail waves frantically, a combination that drives large gamefish crazy. All Magnum Bull Dawgs and Magnum Uptown Bull Dawgs are 12", 6oz. with two 6/0 hooks. Description: The Super Magnum Bull Dawg, A.K.A. 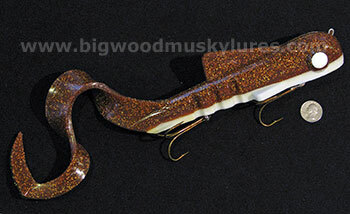 "The Pounder", is a hand poured, 100% soft plastic lure. It is balanced with a jig head so it swims down at a 45º angle on the fall and swims horizontal on the retrieve. 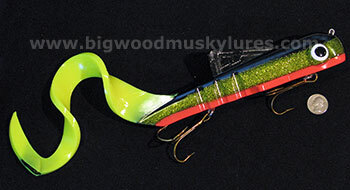 The Bull Dawg, by Muskie Innovations, can be used as a crankbait, jerkbait or a jig. 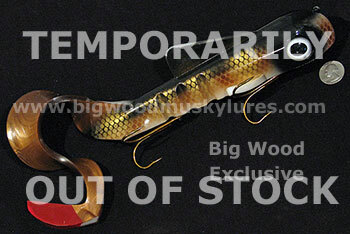 Bull Dawgs are considered to be one of the most versatile lures on the market today. When retrieved, it rocks back and forth as the curly tail waves frantically, a combination that drives large gamefish crazy. Super Magnum Bull Dawgs are 15", 16oz. 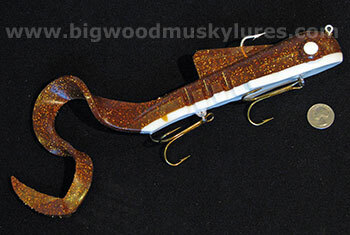 Description: Hand Painted, Custom Pounders from Musky Innovations! 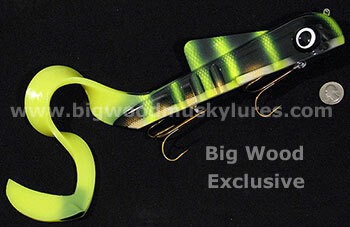 With Colors Exclusive to Big Wood Musky Lures, photos don't do justice to these custom Pounders. Made in the U.S.A.. 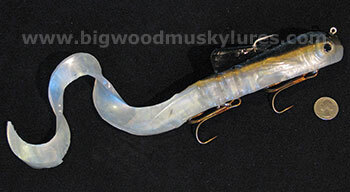 The Super Magnum Bull Dawg is a hand poured, 100% soft plastic lure. It is balanced with a jig head so it swims down at a 45º angle on the fall and swims horizontal on the retrieve. 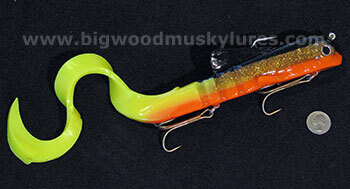 The Super Magnum Bull Dawg can be used as a crankbait, jerkbait or a jig. The Bull Dawg by Muskie Innovations, in any size, has long been considered to be one of the most versatile lures on the market. When retrieved, it rocks back and forth as the curly tail waves frantically, a combination that drives large Muskies crazy! 15" 16 oz.